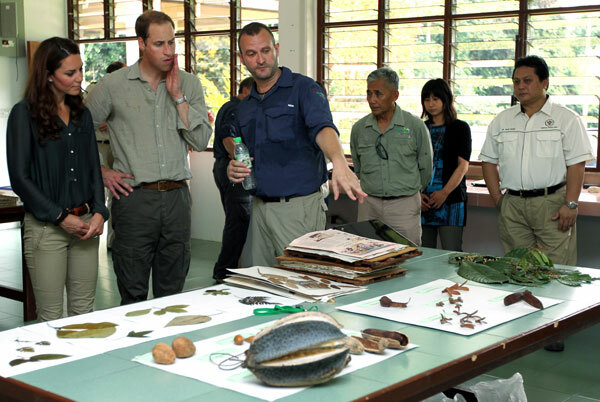 REYNOLDS (third left) briefing William and Kate on their research during the Royal Highnesses visit to the Danum Valley Field Centre Laboratory, yesterday. LAHAD DATU: Britain’s Prince William and his wife Catherine Middleton, or fondly known as Kate, did not mind the sun, at all. In fact, the Duke and Duchess of Cambridge refused transportation and chose to walk a distance of 500 metres from the Danum Valley Terrace House to meet 25 researchers and Oxford University undergraduates at the Field Centre Laboratory. The nature-loving royal couple decided to walk through Danum Valley, Malaysia’s well-reserved rainforest, here, to end their visit to Malaysia. Spending about three hours touring the Danum Valley Conservation Area, they also sat on tree branches to be briefed on ants and the other living creatures on trees within the 43,800 hectares conservation area. They came in by Sabah Air’s eight-seater helicopter at 10.15am, where the Royal Highnesses were ushered in for a briefing on the conservation works jointly carried out by Yayasan Sabah and the Royal Society’s South East Asia Rainforest Research Programme (SEARRP), by Yayasan Sabah Conservation and Environmental Management Division group manager Dr Waidi Sinun, SEARRP’s director Dr Glen Reynolds, Sabah Tourism Board chairman Datuk Tengku D Z Adlin and Sabah Forestry Department director Datuk Sam Mannan, to mention some. William became a Royal Fellow of the Royal Society during the Royal Society’s 350th anniversary celebrations in 2010. The couple showed their strong interest in the progress of conservation works in the area, and asked details on other issues such as the impact on the wildlife, such as the Orang Utan and the Proboscis monkeys. After the half-an-hour briefing, the Royal couple, who were spotted with matching jungle-themed outfit, trekked into the rainforest to experience the area’s remarkable biodiversity for themselves. William and Kate walked through the rainforest to reach the Danum Valley Research Center, which is located deep inside the rainforest and is run by the Royal Society. Their visit to the forest was planned because of William’s longstanding interest in conservation, and offered the royal couple an opportunity to experience the ecological wealth of Sabah’s forests and the importance of supporting the efforts of the scientists working to understand and conserve them. Dr Kalsum Yusah, who is doing her research on ants in Danum Valley, was all excited when told that she would be briefing the royal couple at one of her research spots. “They were pulled up to a branch, 50 metres above the ground, which is equivalent to seven-storey high building, to listen to my findings on ants and its impact to the environment. They were very nice and looked very interested in nature as a whole,” she said. Waidi, meanwhile, described the royal couple’s visit as “successful and beneficial”. “The Duke of Cambridge did say that his father (Prince Charles) has a soft spot for the rainforest. “To me, the visit was both successful and beneficial as it will now lift the Danum Valley Conservation Area to a higher level. It is truly a recognition to the joint effort by Yayasan Sabah and the Royal Society, especially to our conservation works. “We believe what has and being done here is important and is globally significant … and I believe that was what attracted the royal couple to come to this part of the world,” he said. After spending about three hours at the Danum Valley Conservation Area, the Royal couple took off for the Borneo Rainforest Lodge’s 300 metres canopy walk, before adjourning to a private lunch at the lodge. He said the Royal Society is approaching its third decade collaboration with Yayasan Sabah to help develop effective conservation, management and restoration strategies for these vital ecosystems and environmental research and management capacity in the scientific community of Malaysia. The Duke and Duchess then took the commercial aircraft to Kota Kinabalu. Malaysia is the royal couple’s second destination after Singapore on their nine-day tour of the Far East as representatives of Her Majesty Queen Elizabeth II in conjunction with the celebration to mark the 60th reign of the Queen of England. They are scheduled to visit the Solomon Islands and Tuvalu next. THE Royal Highnesses walking on the suspension bridge after trekking the Danum Valley rainforest, yesterday.